Clean water is vital to our health, communities, and economy. People depend on clean water for their health: About 117 million Americans – one in three people – get their drinking water from streams protected by the Clean Water Rule. Our cherished way of life depends on clean water: healthy ecosystems provide wildlife habitat and places to fish, paddle, surf, and swim. Our economy depends on clean water: manufacturing, farming, tourism, recreation, energy production and other major economic sectors need clean water to function and flourish. View a map of counties with small streams that provide drinking water. We are protecting the streams and wetlands that form the foundation of our nation’s water resources. We need clean water upstream to have healthy communities downstream. The health of rivers, lakes, bays, and coastal waters depend on the streams and wetlands where they begin. Streams and wetlands provide so many benefits to communities by trapping floodwaters, recharging groundwater supplies, filtering pollution, and providing habitat for fish and wildlife. Learn more about streams and wetlands. Science shows us the most important waters to protect. In developing the Clean Water Rule, the EPA and U.S. Army Corp of Engineers utilized the latest science, including a report summarizing more than 1,200 peer-reviewed, published scientific studies which showed that small streams and wetlands play an important role in the health of larger downstream waterways like rivers and lakes. Read a blog on the science report. Climate change makes protection of water resources even more essential. Impacts from climate change like drought, sea level rise, stronger storms, and warmer temperatures threaten the quantity and quality of America’s water. 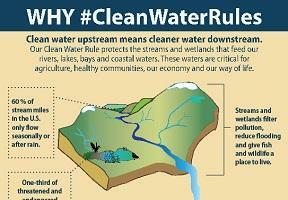 Streams and wetlands help provide the clean and reliable water that our communities and businesses need. Adaptation to climate change includes protecting our water. Read more about the impacts of climate change.